OSLO, Norway, March 20, 2019 (GLOBE NEWSWIRE) -- Opera, the Norwegian browser developer, released a new version of its mobile browser, Opera for Android 51, which now features a built-in VPN service. The new browser VPN is free, unlimited and easy to use. When enabled it gives users enhanced control of their online privacy and improves their online security, especially when connecting to public Wi-Fi networks. With this addition, Opera marks a new standard for privacy and security in mobile browsing. “There are already more than 650 million people using VPN services globally. With Opera they can now enjoy a free and no-log service that enhances online privacy and improves security,” said Peter Wallman, SVP Opera Browser for Android. When users enable the built-in VPN, they will create a private and encrypted connection between their mobile devices and a remote VPN server, using strong 256-bit encryption algorithms. When enabled, the VPN will hide the user's physical location and will make it hard to track their behavior on the Web. The browser VPN service is also a no-log service, which means that the VPN servers do not log and retain any activity data, all to protect users' privacy. The built-in VPN is a very useful feature for Internet users who connect to public Wi-Fi in coffee shops, airports and hotels. The VPN will send users’ requests through a secure tunnel that encrypts Internet traffic coming in and out from their mobile devices. This reduces the risk of malicious third parties collecting sensitive information. Currently, there are more than 650 million VPN users around the world. According to a report by the Global World Index in 2018, the use of VPNs on mobile devices is rising. More than 42 percent of VPN users on mobile devices use VPN on a daily basis, and 35 percent of VPN users on computers use VPN daily. The growing adoption of VPN services indicates that a built-in VPN is a must-have feature in modern browsers. Today, Internet users are searching for great solutions that give them more confidence when browsing the web. “We want to make VPN adoption easy and user-friendly, especially for those who want to feel more secure on the Web but are not aware of how to do it. This is a free solution for them that works,” said Wallman. Enabling the browser VPN is simple. Users need to tap on the settings of the browser, go to VPN and enable the feature according to their preference. They can also select the region to which they want to connect to. The built-in VPN is free, meaning users don’t need to download additional apps on their smartphones or pay additional fees as they would for other private VPN services. 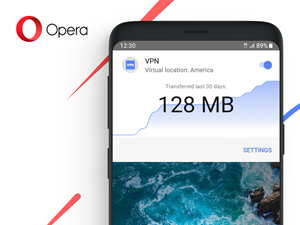 With no sign-in process for Opera’s VPN service, users don’t need to log in every time they want to use it, but simply hit a switch. Opera for Android is available for download in Google Play. The rollout of the new version of Opera for Android 51 will be done gradually per region.